Disk Doctors Windows Data Recovery is comprehensive recovery software for recovering lost data from FAT and NTFS partitions. It is much more then an undelete software or a file recovery software. It is a bundle of advanced tools which provide recovery from severe corruptions, when other software fails to recover or even is not able to display data. 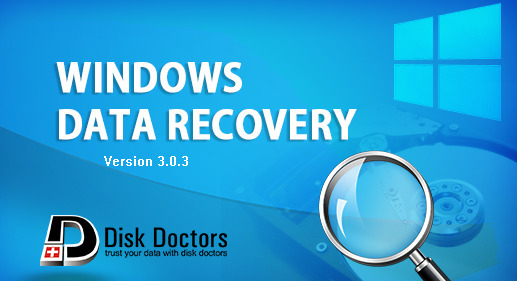 Disk Doctors Windows Data Recovery 3.0.3.353 Software can recover data from any logical cause for data loss on Windows. This data recovery software combines its indigenously designed algorithms TurboScanTM and File TracerTM to recover data from severely corrupted Windows partitions. Disk Doctors Windows Data Recovery can recover accidentally deleted files, including files emptied from Recycle Bin, from Windows Explorer with the SHIFT + Delete key, accidental use of system recovery CD or reloading of Windows causing loss of data on older partition. The recovery attempt would be successful only if this windows data recovery software is used before the files are permanently overwritten by new data on windows drive. With Disk Doctors Windows Data Recovery software, lost data recovery is possible from a reformatted partition (to any file system), corrupted, deleted or missing partition. This Windows data recovery software has the best partition recovery module to locate deleted / lost partitions with the help two scanning methods i.e. Quick Scan and Thorough Scan. These scanning methods locate and validate lost partitions from entire physical hard drive. Sophisticated scanning algorithm helps in aligning all directories and sub directories together as they were, including support for long files names. Preview Files before recovery features allows you to see the chances of data recovery even with the demo version of the software. Disk Doctors Windows Data Recovery is a read-only application, which means that it will only read the contents of a faulty drive and would never attempt to write to the drive you are about to recover. However, you would need to provide a safe destination / healthy drive to write recovered data, or to install the software. With the help of on-screen "wizard", you are guided through the data recovery, disk-imaging processes systematically. When all is accomplished, you will be able to use the once-lost data just as before. Disk Doctors Windows Data Recovery is Windows Recovery software for the FAT 16, FAT 32, VFAT, NTFS, and NTFS 5 file systems used in Windows Operating System and supported by various other operating systems. Based on the requirements you may select individual components of Disk Doctors Windows Data Recovery or use Windows Data Recovery Software to recover data from both FAT & NTFS partitions. * Supported File types: JPG, JPEG, TIF, GIF, RIFF, TIFF, PNG, BMP, Canon - (CRW, CR2), Nikon (NEF), Minolta (MRW), Sony (SR2), and Olympus (ORF). Fuji (RAF) and many other common and RAW file types are supported.